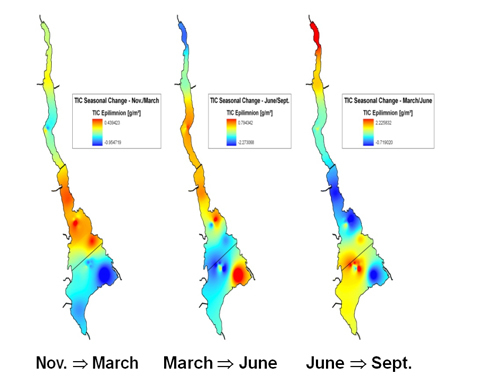 A major aim of this project will be to incorporate the real-time data available from the sensor network into a forecast system for lake phytoplankton behaviour (initiation, peak bloom and senescence) and, in particular, to provide warning for the onset of cyanobacterial blooms. For this we will use the phytoplankton community model, PROTECH, along with the real-time data and medium term weather forecasts. PROTECH is a well-established, one-dimensional model, simulating lake thermal characteristics, overall algal biomass and biomass of individual phytoplankton species. Uncertainty in making forecasts resulting from inherent uncertainties in the knowledge of inputs to the lake, the representation of the processes in the lake, and the future weather conditions will be accounted for. Uncertainties in future weather conditions can be allowed for by using the ensemble weather predictions available from the European Centre for Medium-range Weather Forecasts (ECMWF). This part of the project is led by Dr Alex Elliott, CEH and Professor Keith Beven at Lancaster University. Above: PROTECH output for Blelham Tarn. The different coloured lines represent different phytoplankton species or functional types. role in sequestering particulate organic carbon in sediments. 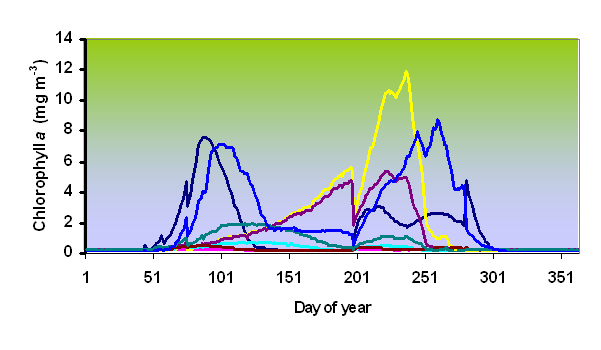 Diel to seasonal variability of [CO2 (aq)] using dissolved CO2 sensors and CO2 calculated from pH and water temperature and approximately monthly manual measurement of DIC and alkalinity flux. The rate of loss of epilimnion DIC and POC to fluvial export supported by measurements of dissolved oxygen concentration and the continuous monitoring of lake outflows. Carbon flux to the sediments at monthly resolution by deployment of sequencing sediment traps in deep water locations of three lakes in the first year and three further lakes in the second year. It is well known that lakes can show a regionally coherent response to large-scale weather patterns such as the North Atlantic Oscillation, the position of the north wall of the Gulf or the jet-stream mediated by Rossby Wave breaking. Lakes may also be synchronously affected by the effects of atmospheric deposition, meteorological effects on the catchment and hydrological connectivity. 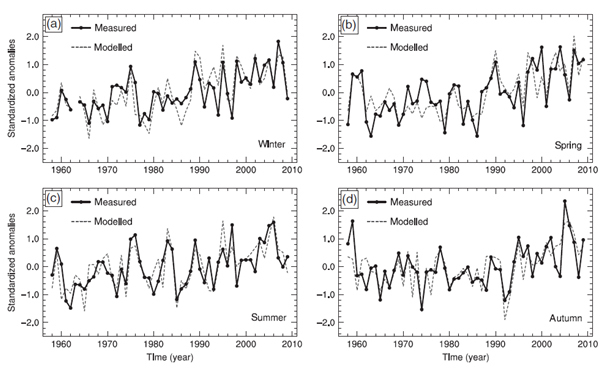 Until recently, all the studies of coherence have used routine monitoring data, at best at weekly resolution, to investigate coherence on seasonal or interannual timescales. The degree of coherence is governed by the strength of local, lake-specific factors compared to the strength of regional drivers. On long-time scales, trends in local characteristics, such as eutrophication, may obscure regionally synchronous behaviour at finer scales. Use of high resolution data to examine coherence in lake temperatures has just begun but, as yet, coherence of biological, chemical or wider physical variables on these short time-scales has not been investigated. linking coherence of eg, temperature, to physical processes such as total heat flux and to meteorology. This work is being carried out by a tied PhD student, Iestyn Woolway, largely funded by OTT Hydrometry and registered at University College London, and supervised by Jon French and Stephen Maberly.